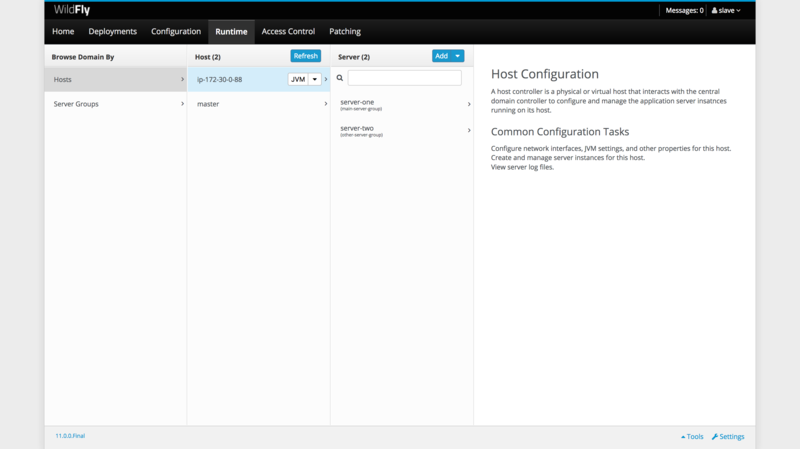 When configuring a WildFly domain in a cloud environment, it is often not possible to rely on fixed IP addresses or network broadcasts to discover resources. One solution offered to AWS users for discovering domain controllers is to use a S3 bucket as a central configuration point. In this blog post we'll take a look at how to configure a simple WildFly domain in AWS using a S3 bucket for discovering domain controllers. To start with we will need an IAM user with permissions to access the S3 bucket. The keys for this user will be used by WildFly to update the S3 bucket with the details of the domain controller. In this example we will be using a bucket called wildfly-domain. To grant access to this bucket, the IAM user whose keys WildFly will be using has the following security policy. With this policy in place we need to create the access keys. Make a note of the Access key ID and Secret access key when they are generated, because AWS will not show you the secret access key again. The S3 bucket itself is nothing special. It requires no special features to be enabled, so simply create a bucket with the name referenced in the security policy (wildfly-domain in our case). There are a number of steps required to configure the domain controller to allow slave instances to discover it via the S3 bucket and connect. The output of creating a user called slave is shown below. We'll need this to configure the slave instance later on. In the domain/configuration/host-master.xml file, replace the default contents of the <domain-controller> element with the following code. This configuration instructs the domain controller to save its details in the wildfly-domain S3 bucket when it is started. By default the management interface is bound to localhost, and in this situation the domain controller will dutifully save configuration in the S3 bucket indicating that it can be reached on 127.0.0.1, which is obviously not useful information when the slave is running on another instance. To fix this the domain controller must bind its management port to the external interface. Here we have started the domain controller with the -bmanagement=<ip> argument, which instructs WildFly to bind the management port to the IP address of the external NIC. We have also supplied the name of the host configuration file via the --host-config parameter. Once the domain controller has booted you will find new files created in the S3 bucket. To configure the slave we need to edit the domain/configuration/host-slave.xml file. Replace the contents of the <server-identities> element with the <secret> that was generated by the add-users.sh script when we created the slave user. Then replace the contents of the <domain-controller> element with the following code. With the domain controller and slave both running, we can use the management console to view the details of the domain. Open up http://domaincontrollerip:9990. You will be prompted for credentials. Normally we would have a dedicated user created for the management console, but for convenience we can just use the slave user that we created earlier. Under the Runtime tab we can see that the master and slave hosts are indeed connected as expected. Using S3 buckets as a central point of configuration is an easy, convenient and reliable way to configure a WildFly domain in AWS. It removes the need to have fixed IP addresses, and works around the AWS limitation of preventing network broadcasts.